Winery opens on Winter St. 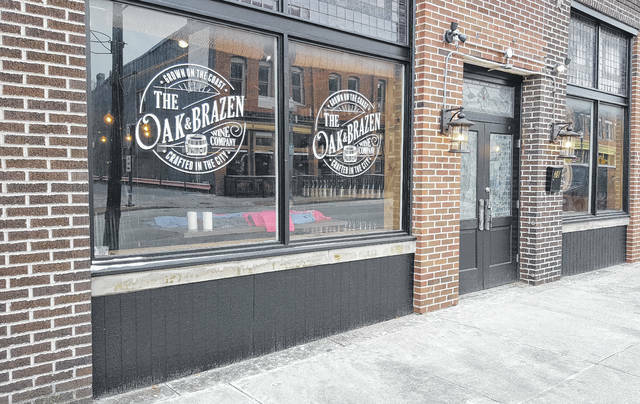 The Oak & Brazen Wine Company, located next to the historic Strand Threatre at 38 E. Winter St. in downtown Delaware, opened its doors on Dec. 23. The new venture is owned by Jeff and Gina Kirby of Powell and Barb Lyon, who is a partner in the business. 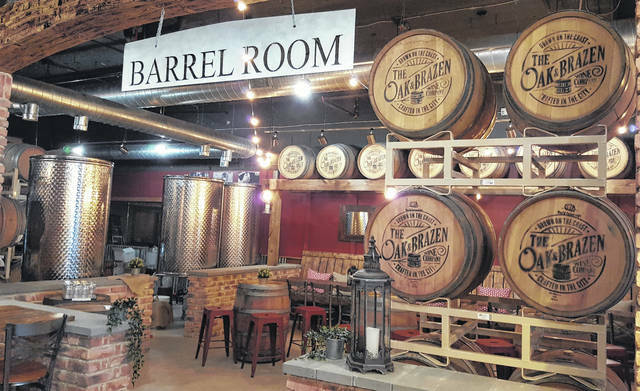 The Barrel Room inside The Oak & Brazen Wine Company, which offers a up-close view of the wine production room, can be rented any day of the week for parties, bridal showers, company outings, etc. Thanks to some blood, sweat, and tears, 38 E. Winter St. in downtown Delaware — the vacant eyesore next door to the 101-year-old historic Strand Theatre — has its first tenant in over a decade. On Dec. 23, after months of renovation work, The Oak & Brazen Wine Company officially opened its doors to the public. For owners Jeff and Gina Kirby of Powell (Barb Lyon is a partner in the business), the new venture is the couple’s third such go-around in the alcohol-production business having opened the Powell Village Winery in 2011 and partnering in 2016 to open the Dove Mountain Brewing Company (handcrafted beers) in Marana, Arizona. At four times the size of the Powell Village Winery — the couple sold the tasting room portion of the Powell business to their former manager last year after becoming first-time parents — Mr. Kirby said The Oak & Brazen Wine Company is the couple’s attempt at taking their wine production company to the next level. Despite having not housed a business since the Finish Line Bar & Grille over a decade ago, when Kirby — a graduate of the Knowlton School of Architecture at The Ohio State University — got his first look inside 38 E. Winter St., he instantly “had a vision” that led to the couple purchasing the building, which had become a shell of its former self. “When I walked in I kind of saw what I wanted it to become, and I think it has become that,” Kirby said. The transformation, however, didn’t happen overnight as Kirby spent six months making sure his vision for the building was realized. As the name suggests, the primary focus of the establishment is clear. As for the selection, The Oak & Brazen Wine Company serves a rosé, along with different varieties of whites, reds, reserves, and sangrias. Kirby said in addition to wine — it can be purchased by the bottle, in single tastings (1 ounce), by the glass, or through the wine flight (choice of any four half glasses) — the business also serves local craft beers that will be rotated on a regular basis. While The Oak & Brazen Wine Company does serve some locally-sourced food in the form of “sharables” like flatbreads, cheeses from The Greater Gouda, breads and chocolates from Fresh Start Cafe and Bakery, and dipping oils from Olivina Taproom, the establishment is far from a full-service restaurant. Kirby said he would be remiss if he didn’t mention how welcoming city residents and officials have been. “What I’ve come to know is Delaware loves their local businesses, which is truly what we are with us producing the product right here,” he said.